Stock photo of a full moon at dusk shining over the snowcapped Fairholme Range during winter, as seen from 2nd Vermilion Lake near the town of Banff in Banff National Park, Canadian Rocky Mountains, Alberta, Canada. 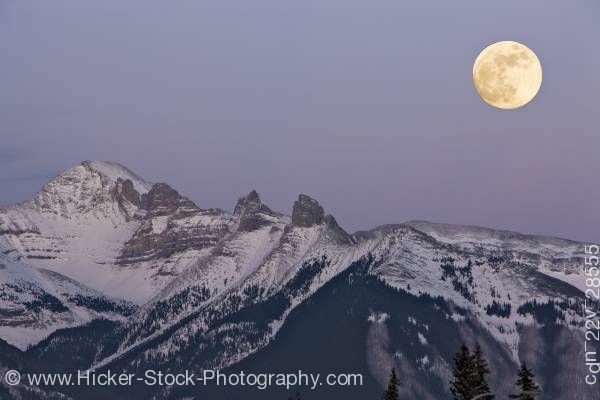 This stock photo shows a full moon over the snow capped Fairholme Range at dusk during winter as viewed from 2nd Vermilion Lake near the town of Banff in Banff National Park, Canadian Rocky Mountains, Alberta, Canada. Banff National Park forms part of the Canadian Rocky Mountain Parks UNESCO World Heritage Site.